What are the implications of a star systems missing a massive gas giant such as our Solar Systems' Jupiter –it could imply conditions of massive bombardment from comets and asteeoids that would prevent the development of advanced life. The artist's impression below of the debris disc and planets around the star known as Gliese 581, superimposed on Herschel PACS images at 70, 100 and 160 micrometre wavelengths. The line drawing superimposed on the Herschel image gives a schematic representation of the location and orientation of the star, planets and disc, albeit not to scale. GJ 581’s planets have masses between 2 and 15 Earth masses and are all located within 0.22 Astronomical Units (AU, where 1 AU is the distance between Earth and our Sun) of the central star. 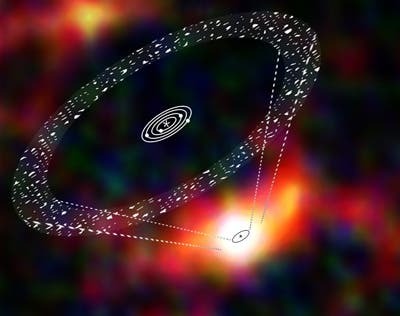 Minus a Jupiter-like gas giant, a vast debris disc extends from approximately 25 AU to 60 AU. Two NASA astronomers recently suggested that the size and location of an asteroid belt, shaped by the evolution of the sun's planet-forming disk and by the gravitational influence of a nearby giant Jupiter-like planet, may determine whether complex life will evolve on an Earth-like planet. Rebecca Martin, a NASA Sagan Fellow from the University of Colorado in Boulder, and astronomer Mario Livioof the Space Telescope Science Institute have concluded that Solar systems with life-bearing planets may be rare if they are dependent on the presence of asteroid belts of just the right mass. Asteroids may have delivered water and organic compounds to the early Earth. According to the theory of punctuated equilibrium, occasional asteroid impacts might accelerate the rate of biological evolution by disrupting a planet's environment to the point where species must try new adaptation strategies. The astronomers based their conclusion on an analysis of theoretical models and archival observations, including infrared data from NASA's Spitzer Space Telescope. "Our study shows that only a tiny fraction of planetary systems observed to date seem to have giant planets in the right location to produce an asteroid belt of the appropriate size, offering the potential for life on a nearby rocky planet," said Martin, the study's lead author. "Our study suggests that our solar system may be rather special." Martin and Livio suggest that the location of an asteroid belt relative to a Jupiter-like planet is not an accident. The asteroid belt in our solar system, located between Mars and Jupiter, is a region of millions of space rocks that sits near the "snow line," which marks the border of a cold region where volatile material such as water ice is far enough from the sun to remain intact. "To have such ideal conditions you need a giant planet like Jupiter that is just outside the asteroid belt [and] that migrated a little bit, but not through the belt," Livio explained. 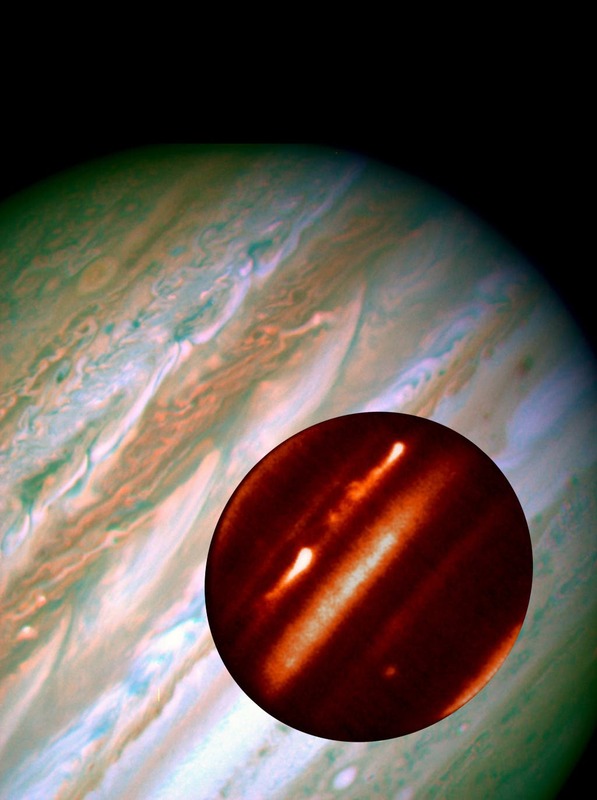 "If a large planet like Jupiter migrates through the belt, it would scatter the material. If, on the other hand, a large planet did not migrate at all, that, too, is not good because the asteroid belt would be too massive. There would be so much bombardment from asteroids that life may never evolve." Using our solar system as a model, Martin and Livio proposed that asteroid belts in other solar systems would always be located approximately at the snow line. To test their proposal, Martin and Livio created models of planet-forming disks around young stars and calculated the location of the snow line in those disks based on the mass of the central star. They then looked at all the existing space-based infrared observations from the Spitzer Space Telescope of 90 stars having warm dust, which could indicate the presence of an asteroid belt-like structure. The temperature of the warm dust was consistent with that of the snow line. "The warm dust falls right onto our calculated snow lines, so the observations are consistent with our predictions," Martin said. The duo then studied observations of the 520 giant planets found outside our solar system. Only 19 of them reside outside the snow line. This suggests that most of the giant planets that may have formed outside the snowline have migrated too far inward to preserve the kind of slightly dispersed asteroid belt needed to foster enhanced evolution of life on an Earth-like planet near the belt. Apparently, less than four percent of the observed systems may actually harbor such a compact asteroid belt. 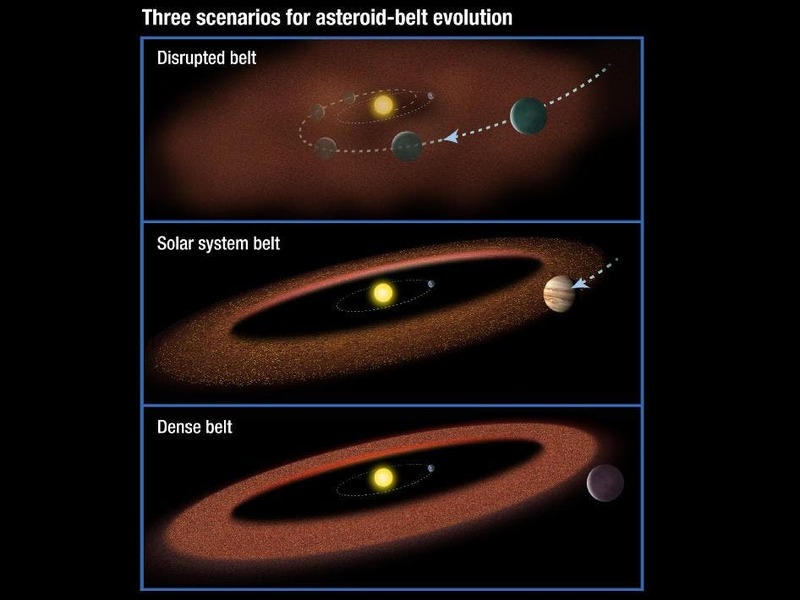 The illustration below shows three possible scenarios for the evolution of asteroid belts. In the top panel, a Jupiter-size planet migrates through the asteroid belt, scattering material and inhibiting the formation of life on planets. The second scenario shows our solar-system model: a Jupiter-size planet that moves slightly inward but is just outside the asteroid belt. In the third illustration, a large planet does not migrate at all, creating a massive asteroid belt. Material from the hefty asteroid belt would bombard planets, possibly preventing life from evolving. The Sagan Fellowship Program is administered by the NASA Exoplanet Science Institute at theCalifornia Institute of Technology in Pasadena, Calif., whose purpose is to advance the scientific and technical goals of NASA's Exoplanet Exploration Program.